The 1953 Hugos were given out at 11th Worldcon in Philadelphia, PA. This Hugo statue is much smaller than the later awards. The rocket was only about half the size of the current rocket. The categories listed here are as they appeared on the 1953 ballot. The 1955 Hugos were given out at Clevention in Cleveland, OH. Novelette: "The Darfsteller" by Walter M. Miller, Jr. The 1956 Hugos were given out at NewYorkCon in New York, NY. 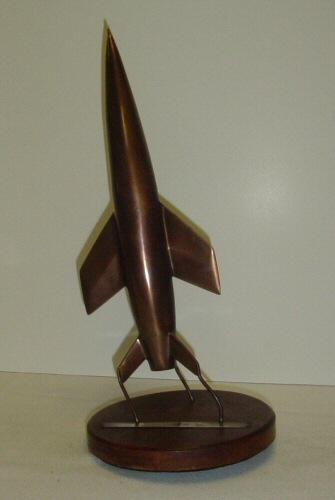 Willy Ley's Hugo was for his 1949 book Conquest of Space, but was awarded in 1956. People who later went to work for NASA said it had been very influential in their decision to work on space flight. This Hugo is on display at the Smithsonian's National Air and Space Museum's Steven F. Udvar-Hazy Center (near Dulles Internation Airport), in the same wing as the the space shuttle Discovery. 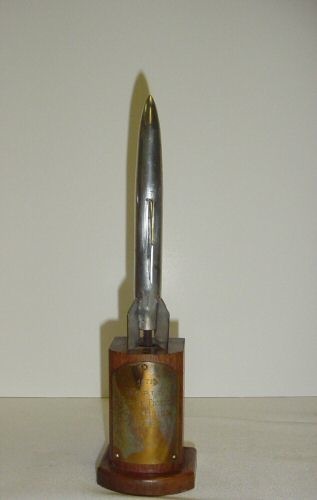 The 1957 Hugos were given out at Loncon I in London, UK. 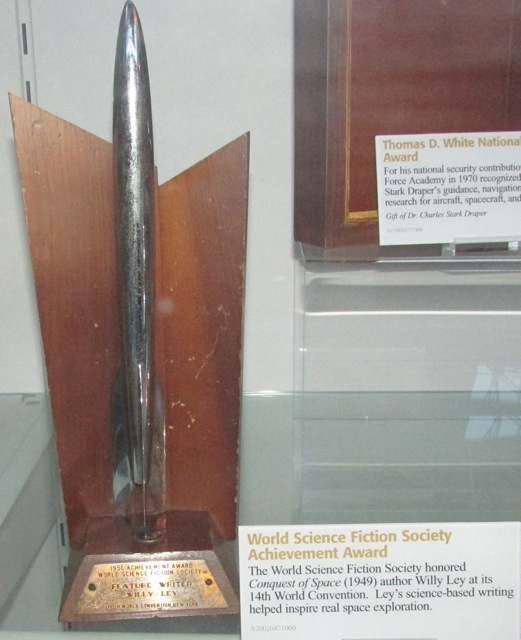 This award looks extremely similar to the International Fantasy Award, an award given out during the 1950s. The 1958 Hugos were given out at Solacon in South Gate, CA. The 1959 Hugos were given out at Detention in Detroit, MI. Hugo winners from the 60s.